TOURBOGRAPH “Pour le Mérite” was launched on the occasion of the company’s twin anniversary on 7 December 2005. This peerless masterpiece was A. Lange & Söhne’s third Lange tourbillon watch of the new era. It was the second one endowed with a fusée-and-chain transmission and the first one with a fusée-and-chain transmission plus a rattrapante chronograph. In Glashütte, precisely 160 years earlier, Ferdinand Adolph Lange had laid the cornerstone not only of his legendary company but also of Germany’s precision watchmaking industry. It is one thing to commemorate these dates, another to celebrate the double birthday in the typical Lange fashion. And so, Lange’s master watchmakers take pleasure in delighting the aficionados of extraordinary complications with a very special opus: a watch of stunning complexity and exclusivity that has never been crafted this way before. The world’s first one-minute tourbillon in a wristwatch format that features a fusée-and-chain transmission combined with chronograph and rattrapante functions is breathtaking. Matching the TOURBILLON “Pour le Mérite” that was presented in 1994, this wristwatch again unites the two likely most complex mechanisms dedicated to enhancing long-term rate accuracy but it goes a step farther. As the name TOURBOGRAPH suggests, this exceptional watch integrates a timekeeping mechanism that even allows lap times to be measured. It is the second Lange watch with the attribute “Pour le Mérite”, an accolade for the superb horological skills of Lange’s master watchmakers. The name alludes to the order of merit inspired by Alexander von Humboldt and sponsored by King Frederick William IV in 1842 for outstanding, predominantly scientific accomplishments. 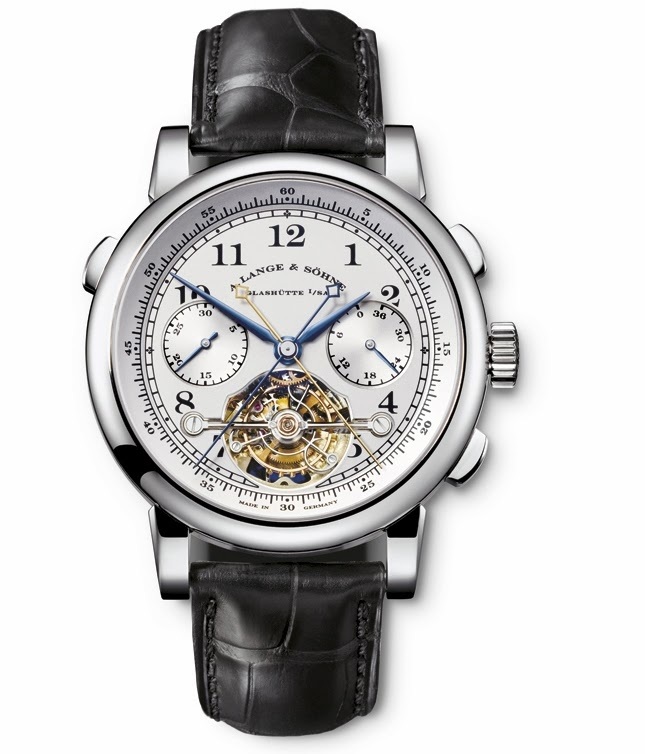 Indeed, the TOURBOGRAPH “Pour le Mérite” is the so far most complex and exclusive wristwatch ever made by A. Lange & Söhne. It is much more than a watch with a tourbillon and far more than just a chronograph. It has no match anywhere in the world with respect to the combination of its extraordinary complications. From the perspective of many watch lovers, the TOURBOGRAPH “Pour le Mérite” is definitely one of the most fascinating Lange timepieces since 1882, when the first rare pocket chronometers or tourbillons with fusée-and-chain transmission were crafted in Glashütte. Today, these watches, cherished by collectors, fetch astronomical prices at auctions. So far, only one Lange watch of the new era had the prestigious attribute added to its name: It was the TOURBILLON “Pour le Mérite”, one of the first four Lange creations presented to the public in Dresden in October 1994. It was the world’s very first wristwatch with a fusée-and-chain transmission. In-house, it was referred to as the “Saxon tourbillon”, with no small measure of pride. This timepiece, long sold out, is meanwhile a rare and coveted collector’s item that already fetches many times its original price at auctions. The ambitious project was launched in the early 1990s by Günter Blümlein, one of the watch industry’s most profound visionaries. He was also the co-founder of Lange Uhren GmbH and the company’s managing director for many years. In view of the limited capacity of the then still very young Glashütte manufactory, Blümlein had secured the co-operation of horology specialists Renaud & Papi in Le Locle for development. Blümlein also sketched out the first ideas for the further evolution of the project with the TOURBOGRAPH in mind. Now, Lange’s master watchmakers have the opportunity to debut the TOURBOGRAPH, a wristwatch with a fusée-and-chain transmission, that they brought to maturity in-house and very much in keeping with the initiator’s concept. They are posthumously dedicating this watch to Günter Blümlein who deceased in 2001. The intricate fusée-and-chain mechanism takes into account a circumstance subject to the laws of physics: The mainspring of a mechanical watch does not deliver the same torque when fully wound as when nearly unwound. The power in the final phase of unwinding weakens and can cause rate inaccuracies. For this reason, the mainspring barrel and the fusée in the TOURBOGRAPH “Pour le Mérite” are interconnected with a delicate chain. It alone consists of more than 600 parts. While the watch is being wound via the crown, the chain is wound up on the tapered fusée and the spring in the barrel is tensioned. Then, the spring’s power is delivered to the movement via the fusée and thus with constant torque. Strictly speaking, the mechanism relies on the lever-and-fulcrum principle discovered by Archimedes: when the mainspring is fully wound and exerts its full force, the chain pulls at the smaller circumference – or lever – of the fusée and when the mainspring’s power declines, it pulls at the larger circumference of the fusée. This ingenious mechanism improves the rate accuracy of the watch across the entirepower reserve range. But what good would it do if, in the crucial moment when themainspring must be rewound, the movement were to stand still? This is why aplanetary gear train composed of 38 parts – it has a diameter of only ten millimetresand is accommodated inside the fusée – was created. It keeps the movement running even while the mainspring is being wound. Since the revival of the heritage of A. Lange & Söhne, two exclusive, limited-edition wristwatches with a one-minute tourbillon – a micromechanical marvel designed to protect the balance against the cumulative effects of gravity – have already found an enthusiastic followership. They are the TOURBILLON “Pour le Mérite” mentioned above and the LANGE 1 TOURBILLON, a wristwatch based on the legendary LANGE 1. It was launched at the turn of the century. Now, the series continues with the TOURBOGRAPH “Pour le Mérite”. This one-minute tourbillon has a number of striking features, among others the decoratively curved, mirror-polished steel tourbillon cage which alone consists of 84 meticulously finished components. True to another Lange tradition, the staff of the filigreed cage is crowned on both sides with a diamond endstone. This is one of the remarkable details that dates back to Lange’s pioneering achievements of the distant past; it was a telling sign of “1A” quality. The tourbillon contains the crucial escapement and rate-regulating elements such as the pallet lever, the balance, and the hairspring; this complex assembly rotates about its axis once a minute. Its purpose was originally to compensate for the influence of gravity on geometrical offsets of the balance. In other words, an error incurred in the first half of the tourbillon cage’s revolution was compensated in the second half. A prerequisite for this to hold true: the watch had to remain in the same position – that applied to pocket watches. In wristwatches, and in view of the metallurgically optimised parts of a modern escapement, the tourbillon no longer really plays a pivotal role. The fascination of this mechanism is mainly attributable to its enigmatic orbital motion and to the challenges imposed on the virtuosos who craft it. In the past, Lange has repeatedly redefined the benchmark in the domain of horological complications, especially in the construction of exclusive chronographs. Two recent examples are the DATOGRAPH which was launched in 1999 and the LANGE DOUBLE SPLIT presented in 2004. The exceptional TOURBOGRAPH borrows the second half of its name from this chronograph legacy. It features the very culmination of mechanical timing technology, the rattrapante function, modestly suggested by the third push piece at 10 o’clock. The mechanism, positioned directly behind the sapphire-crystal caseback, is not only one of the most precious but also one of the most beautiful assets of a mechanical movement. The twin sweep seconds hands, delicate and superimposed, allow additive time measurements of up to 30 minutes as well as – concurrently – the measurement of any number of lap times. Those who love horological complications have always been mesmerised by these useful stopwatch functions. No wonder: The TOURBOGRAPH “Pour le Mérite” features two classic column wheels in a very elaborate mechanical subsystem to dependably and precisely control the two chronograph functions. Only twelve of these exceptional timepieces – it takes 30 days just to assemble each one – can be crafted in a year. It goes without saying that every single exemplar is embellished by hand to a degree of perfection that can hardly be surpassed. For instance, the decoration of the delicate tourbillon bridge alone, the part with which the tourbillon cage is mounted on the dial side, is a two-day project for Lange’s gifted specialists. For the manual circular graining process involving the plates and bridges, they use up to 14 different special tools to obtain the desired perlage effects. Thus, the TOURBOGRAPH “Pour le Mérite” in its 41.2-millimetre case is not just an incomparable timepiece that adds a new chapter to the long list of impressive masterpieces crafted at the manufactory in Glashütte. It gives its few owners the certainty, with each glance at the face and display back, that they have acquired an authentic and extremely precious work of art. Only 101 of these watches were produced. The first 51 TOURBOGRAPH “Pour le Mérite” were cased in platinum. A second series of 50 watches, was cased in gold. Nivarox 1 hairspring with a frequency of 21,600 semi-oscillations per hour (3 Hertz). Limitation: 101 in total, of which 51 in platinum as well as 50 in gold . Case: Ø 41.2 mm, platinum. Hands: Blued steel and gold plated. Glas and Caseback: Sapphire crystal glass.